It is plain to see how this is a paradox from a labour market point of view. If the norm is a historical legacy from a pre-market era then surely the high seasonal demand for labour should work to weaken the norm as workers and employers both might gain from opening up the labour market to men. But we actually observe the opposite. In regions where cotton farming happens to be particularly intensive are also the ones where the gender segregation of harvesting work is the strongest. The key, I think, is wages. 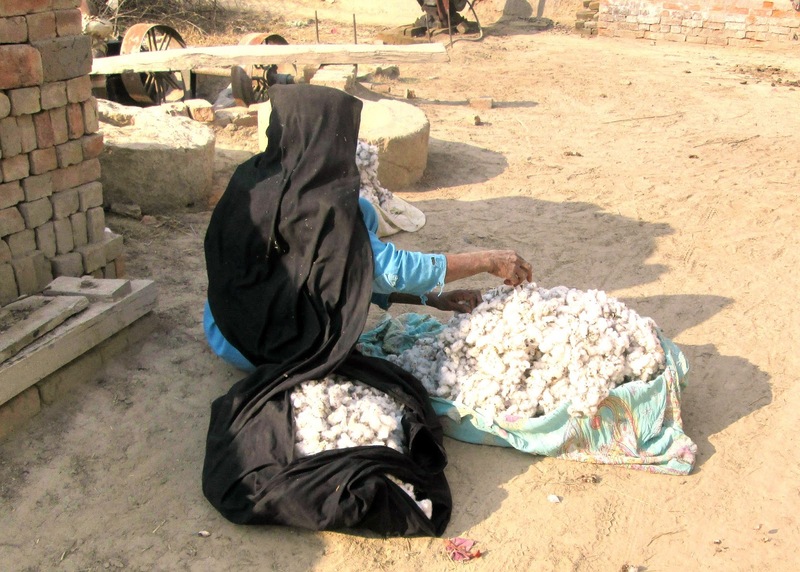 Although cotton-harvesting, like many other agricultural activities in Pakistan, is paid by piece rate – that is, by the amount of cotton picked – average daily earnings are around half the wage rate for male casual labourers. Demand for labour and thus remuneration will have to rise substantially before men would consider breaking the social norm and taking up this activity. But this is not likely to happen because even in regions which specialize in cotton there is a ready supply of women who are willing to work at the lower wage, partly because higher paid ‘men’s work’ is closed to them. Employers are happy enough with the notion that cotton harvesting is women’s work. Admitting that it might be men’s work would imply offering a wage which was comparable to the basic wage for other activities that were deemed to be ‘men’s work’. The labour market is not just segmented by gender. We observed that the norm did not apply to men from marginalized communities such as Scheduled Caste Hindus who did take part in cotton harvesting at low wages. They were spoken of as lesser men, and thus fit for what was otherwise women’s work. In regions where cotton farming is less well-established employers might sporadically hire male workers, and men might, as a one-off, consider taking part in harvest labour. Because the activity is not widespread violations of the norm do not have major implications either for wages offered for cotton harvesting, or for wage rates applicable to male labourers from the majority Muslim community. It is in the cotton-intensive regions where neither employers not workers, have an incentive, on the margin, to challenge the norm. For an individual employer, attracting male workers will imply considerably raising the piece-rate which will then apply to men and women alike. And for an individual male labourer, considering working in cotton-harvesting would imply accepting a ‘woman’s wage’. I now believe that the sustained gendered division of agricultural activities in Pakistan between men’s and women’s work is partly a result of a deeper and more insidious norm – that women (and Scheduled Caste men) should earn significantly less than men from the majority community. In technologies where many activities require the application of certain types of physical strength, men will have an advantage over women. But this cannot, by itself, explain the significantly lower wages in activities which are deemed to be women’s work. It is my strong hunch that it is social hierarchy and inequality rather than the type of activity that drive the wage gap. And the non-existent enforcement of minimum wage and wage equality laws keeps wages low for men and lower still for women (and Scheduled Caste men). The implications of all this are likely to be far-reaching, and cotton-harvesting is simply a vantage point. Social norms which seem to divide tasks and activities in agriculture (and in other sectors) into women’s and men’s work respectively, are widespread, and need to be examined critically. Norms around work are closely connected with norms about who provides care for infants and young children, which in turn determine nutritional outcomes. The norm of low and unequal wages will continue to confront women agricultural workers with a terrible choice – work to provide for their children or find the time to care for them. The same applies in other fields as well in Pakistan and across the world. For example in Pakistan, women domestic workers are also paid significantly less than men doing comparable jobs. In the West we know that the wage gap between women and men is maintained through more subtle means particularly related to women being left behind on the career ladder because of childrearing responsibilities. Anyway, thanks for posting this important insight from your research. Thank you for your comments. They are well-taken. We hope to look further into the links between women’s work and child care. Watch this space.